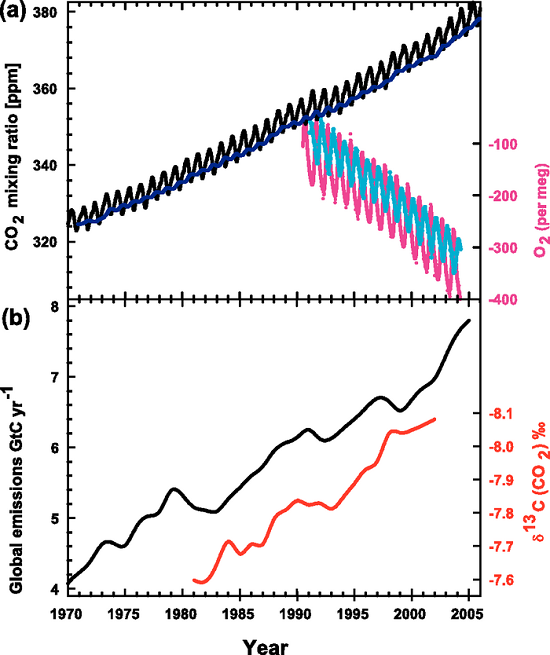 Here, again, is the IPCC graph (Figure 1) illustrating the rise in atmospheric CO2 (panel a, black saw-toothed line) and the decreasing 13C:12C ratio in the same CO2 (panel b, red line). Can you help me interpret the red line? Does it indicate a decline (negative change) in the C13 isotope (i.e. -7.7 = -7.7 parts per thousands) or are the values showing a ratio of C13/C12 because of the delta symbol? If the red values do represent a ratio can you illustrate with a hypothetical example how a negative value was calculated; for instance how do you get a negative value by comparing C13 with C12 (I would have thought a ratio would produce a fraction of some sort)? Notice that this equation contains a multiplication by 1000, which is where the "per mil" comes from. The values are multiplied by 1000 because they are very small numbers and this multiplication trick makes the values more "user-friendly". Look again at the IPCC graph which gives the δ-value in 1981 as -7.6‰, the "per mil" symbol tells us that the original value was multiplied by 1000, thus the original value was -0.0076. But what does -0.0076 mean? Has the 13C decreased by 0.0076...somethings? Look again at the δ-value equation. You can see that the top part of the fraction within the bracket is the ratio of 13C:12C from some sample containing carbon. The bottom part of the fraction is another 13C:12C ratio from a standard sample which has a known, unchanging ratio of 13C:12C. For carbon isotopes, the standard used is a limestone formation from South Carolina called the Pee Dee Belemnite (or PDB)1, which has an unusually high amount of 13C. The δ-value is basically a ratio of ratios and can be thought of as a scale to compare different isotope ratios (Figure 2). The standard sample is the zero point of this scale. If there is more 13C in our sample than in the standard, then the δ-value will be positive; if there is less 13C in our sample than in the standard, then the δ-value will be negative. The δ-value doesn't give us a specific number about our sample, as in x ppm of 13C, rather it tells us the relative difference between the sample and the standard. Figure 2. Isotopic ratios of samples are compared to an unchanging isotopic ratio of a standard. The standard defines the zero point of the scale. 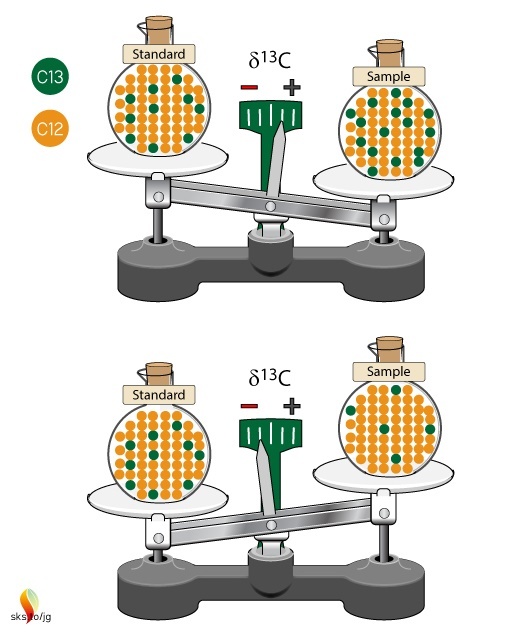 Samples with more 13C than the standard will have positive δ13C values, while samples with less 13C than the standard will have negative δ13C values. Isotope ratio mass spectrometers measure relative isotopic ratios much better than actual ratios. By comparing to a standard, the precision of the data values are much, much better since all values are relative to a given standard. She also points out that δ-values make it "easier to compare results both among isotope laboratories and within a single laboratory over a long time period". This works out to a ratio of 0.0111516 for the 1981 sample. For 2002 the δ-value was -8.1‰, which gives a ratio of 0.0111459. Let’s broaden our view out a bit further than that twenty year time span. This graph in Figure 3 (from CSIRO, the Australian agency for scientific research) shows that before the Industrial Revolution the δ-value was -6.5‰. In today's atmosphere, the 13C:12C ratios give a δ-value of -8.5‰. Figure 3. There has been an increase in the atmospheric concentration of CO2 (in red), as identified by the trend in the ratio of different types (isotopes) of carbon in atmospheric CO2 (in black, from the year 1000). CO2 and the carbon-13 isotope ratio in CO2 (δ13C) are measured from air in Antarctic ice and firn (compacted snow) samples from the Australian Antarctic Science Program, and at Cape Grim (northwest Tasmania). (Copyright CSIRO Australia). The table below shows the δ-values for various times along with the corresponding isotopic ratios, expressed both as decimals and as percentages of 13C and 12C in the atmospheric samples. You can see why scientists use δ-values rather than the actual 13C:12C ratio numbers, which only show changes far to the right of the decimal points! These ratios change by very small amounts over time, but they clearly illustrate big changes in the atmosphere's composition of 13C and 12C, pointing to the fossil fuel origins of more and more of the atmosphere's CO2. Here is one final comparison to help make the δ-values more understandable. Annual global average temperatures are usually presented as anomalies with reference to some "base period". 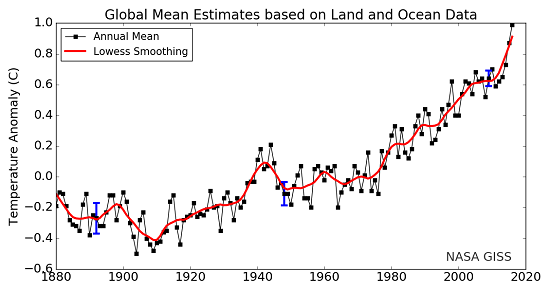 Figure 4 is a familiar graph of this from NASA-GISS with data from 1880 to 2016. The "base period" for this graph is 1951-19802, the annual temperatures for these thirty years are averaged together and this is set as the zero point of the anomaly scale. So, the base period is like the standard sample used as the zero point in the δ-notation scale. Then, each individual year's data point is compared to that zero point. If a year's temperature was warmer than the base period, then the anomaly for that year is positive, such as 2016's record high anomaly of 0.99°C. This is comparable to positive δ-values. Years with colder values than the base period would be negative, like 1904's record low value of -0.5°C. This is similar to the negative δ-values described above. Figure 4. Land-ocean temperature index, 1880 to present, with base period 1951-1980. The solid black line is the global annual mean and the solid red line is the five-year lowess smooth. The blue uncertainty bars (95% confidence limit) account only for incomplete spatial sampling. (NASA-GISS). In both instances, δ-values and temperature anomalies, cumbersome numbers are converted into more meaningful and useful values. In the case of δ-values, very very small changes in isotopic ratios in the natural environment are more easily described, and we can see more clearly how the Earth's climate system works and changes over time. 1. "The original PDB sample was a sample of fossilized shells of an extinct organism called a belemnite (something like a shelled squid) collected decades ago from the banks of the Pee Dee River in South Carolina. The original sample was used up long ago, but other reference standards were calibrated to that original sample. We still report carbon isotope values relative to PDB but now use the term "VPDB" ["Vienna Pee Dee Belemnite"] to indicate that the data are normalized to the values of that standard." (USGS). 2. Any time period, and any length of time, may be used. A thirty year period is often used because thirty years is a long enough time to describe "average" climate variables. David, I can't help thinking that "some people" will dismiss such small changes in delta-values as irrelevant. Is there some way to demonstrate that, on the contrary, the effects are significant? Digby@1 Yes, "some people" might say that such small changes can't tell us anything. It is the same kind of thinking that argues that the amount of CO2 in the atmosphere, and the small increase of that due to human emissions, is too small to matter. Here is the SkS rebuttal dealing with that: How substances in trace amounts can cause large effects. The examples shown in that rebuttal show that small changes can have large consequences. In our everyday lives, most people can't notice such small changes. But scientists know the importance of these changes and so have devised ways to measure them. Beyond telling "some people" these facts and examples, I'm not sure what else can be said. For "some people" their gut feelings about things trump the evidence shining before their eyes. For me, the evidence shown in the CSIRO graph (figure 3) is compelling proof that something is different with the atmosphere's CO2. For most of the last millennium, the delta value was constant at -6.5‰; only in the last ~200 years have we seen a change with those values growing more and more negative. Yes, these are very small changes over time. But these changes are like fingerprints and blood drops at a crime scene: if you know what to look for they contain a wealth of information. Surely there is a more direct response to this question, arising from two facts: 1) Although the delta-C13 number for carbon fuels is different from that of atmospherica CO2, but not very different. 2) There is a lot of CO2 in the atmosphere, so adding more carbon from fuel combustion can only make a small change. Presumably, someone has compared the actual change over the last 200 years (from the ice core) with the amount of fuel burned so far and the delta-C13 of that fuel (although this may not be possible as long as we don't know how much of each isotope goes into the ocean and how fast the limestone is weathering etc.). Finally, the fact that the Ozzie plot seems to be relativley free from "noise" should make anyone more confident that it actually measures something important. Am I correct in thinking that the change in delta value is caused by the burning of fossil fuels? If so, how do you compute the contribution of the latter, given the former? As jbpawley noted above, it's not easy to compute the balance of FF carbon in atmosphere from δ-value if you don't know the isotopic preference of carbon sinks such as ocean & biosphere. As we can see from e.g. annual cycles of keeling curve, about 4-5 times more carbon is exchanged between biosphere and atmosphere, comapared to what is added to the system from FF. CISRO graph in the article is a measure of a strong correlation (pretty amazing BTW) rather than the carbon balance. There are other methods for measuring the amount of FF carbon in the atmosphere. For example by checking Declining oxygen concentration because adding 1 mole of C into atmosphere by burning FF must take 1 mole of oxygen (O2) from it. Other processes involving O fluxes (photosynthesis vs. respiration) are in balance. So you can calculate from the graph therein how much C (that burnes to Co2) and H (that burns to H2O) have been burned. 100% of H2O was taken by ocean, while only some 50% was taken by ocean & biosphere. Knowing all of that, and if you know the proportion of C & H in FF we burned (we do), then you can confirm quantitatively how much CO2 increase to expect from a given O2 decline. Digby @4 "Am I correct in thinking that the change in delta value is caused by the burning of fossil fuels? " Yes. Think of the pre-industrial atmosphere which had a δ13C of -6.5‰, now start burning coal, oil and gas, which has a δ13C of about -25‰. Over time we are adding more and more carbon which is "lighter", i.e. has less and less 13C as compared to 12C. Hence, the δ13C of atmospheric CO2 has shifted lower to about -8.5‰ currently. "how do you compute the contribution of the latter, given the former?" I'm not sure if you can make this computaion. (At least I don't know how to do it!) I don't know if there is a way to say, okay, a decrease in delta values from -6.5 to -8.5 over 200 years = x amount of CO2 emissions from fossil fuels. Check out this NOAA link for more. And if you have more time check out the entire series on isotopes. I can't recommend it enough! Skeptical Science asks that you review the comments policy. Thank you. How to demonstrate to a denier the power of small amounts of stuff. Ask them if they will take .4g g of cyanide. that is to body weight what CO2 is to the atmosphere, or 4 parts in 10,000. Every year, literally tens of thousands of workers in various industries have exposure to and ingest cyanide, most commonly KCN and NaCN. They do not die because the body can deal with and process it. But to much in a short period of time will kill you. You can even purchase certain vegetables in the grocery which if not prepared properly or consumed in to large a quantity will kill you. https://en.wikipedia.org/wiki/Cassava. So natural, abailable, and to much can damage you. Just like to much CO2 can damage the current ecosystem which include us. So, the next time an AGW denier goes on and on about how harmless small amounts of anything are, just offer him some cyanide. Thanks for the help. So the idea is simple, but the computation is difficult. Science is not easy! Please don't confuse us. It's "too much", not "to much".